Kenworth Super 953. Kenworth, now part of PACCAR, is based at Kirkland, near Seattle, USA. The company was born in Portland in 1912 as Gerlinger Motor Car Works and the Gersix in 1915 was a rugged logging truck. The company manufacture road trucks and is always known for its school buses of the 50s like T126 "Pacific School Coach". Besides, Kenworth manufactured a range of very reliable models of off-road truck for oil industry but nowadays, it seems to have only in this field the C500 8x8. Kenworth and Pacific (from Vancouver at right) trucks on a San Francisco Project. Pacific Truck & Trailer LTD started in 1947 and was purchased by International Harvester in 1970, but Pacific production was phased out in early 90s. Pict from the guide of Heidrich Museum, Woodland, Ca, 2001. Terex Titan 6x4, 1974 built by Terex Corp then General Motors in Canada was the biggest truck in the world : empty mass 260 t, payload 350 t, 3300 hp engine whose power was transmitted to four electric motors at each rear wheel, each weighting 4 t with 3,35 m diameter. It was 20,1 m long. Assembled at Sparwood, CB, in 1978 for Kaiser Resources, it ended service in 1990 and, after lifting in 1995, is exposed here. Picture Francis Pierre, 1995. KVW25, 6x6, 1979 from Keable, capacity 100 m3 for garbage transport. Keable, Karl Keable Motor und Maschinenfabrik, was in Germany from 1907 to 1987. Pict from the book 'Off-Highway and Construction Trucks' by Arthur Ingrom and Collin Peck, Blanford Press, 1980. Leyland FV1400 Antar, 6x6, 1954 of total mass 42 t. Leyland lasted from 19th century to 1998 when it was included in US Paccard Company. Leyland built many off-road vehicles for British Army. Dumper Perlini International DPT 305. 450 hp, capacity 36 t, 50 km/h, bucket 16 and 19 m3. Pict J M M at Intermat, Villepinte, 2006 04. Hayes W-HDX 6x6, 1976, sold to Spain. Two of these tractors, from Canada, could tow a trailer of 580 t.
MOL 6x6 of the 80s. MOL, Belgium, founded in 1952 by Gérard Mol, built today trailers, rail-road, port equipment and always trucks with 500 persons and 6 companies. The upper picture, MOL F 7066 6X, may represent a Faun licensed built. Lower is a MOL TB800 6x6. MOL 6x6 truck seen not far from Bordeaux on 2004 04 21. Pict J M M.
MOL 6x6 for forestry. Picture J M M near Bordeaux on 2003 04 21. MOL 6x6 T6066/05 was the largest oilfield model of the company. Pict from book 'Off Highway Trucks in the World' by C J Fraser, Haynes Publishing Group, England, 1985. Rolligon Corp 6x6, Houston, Texas. 7 Ton, 1961. From ebay. Transporter, Six-Bag Drive, 6x6, 7-Ton Rolligon Mark IV, Model 1802, 1961, built by Rolligon Corp, Houston, Texas. Rolligon bags were driven by friction rollers which unfortunately slip when wet. Speed 60 km/h, 195 hp, range 3210 km, Picture from US Military Wheeled Vehicles of Fred Crismon, Crestline Motorbook, 1972. Albee Rolligon, 7 t, 6x6, Off-Highway, Transporter, 1957. Cover of Mechanix Illustrated, Dec 1957. ZIL 6x6 at Truck-Trial of Les Herbiers, France on September 1992. Pict J M M.
ZIL 131 6x6, Loco en Fête, La Ferté Alais, May 2000. Pict J M M.
Kenworth M1A1 heavy recovery truck of WWII. Pict J M M at Loco en Fête, La Ferté Alais, 2009 06 13. Mack Model NO built at Allentown, PA, in 1945 and after rebuilt, has been given to British Army of Rhine before to be sold in 1968 and bought in again in 1995. Rebuilt last four years by owners G. Maskell and Seaham Co. Durham. Pict J M M at Locomotion en Fête, La Ferté Alais, 2007 06. AM General M813 1970, 5 t.
AM General M811 truck 6x6 (1971-1983), extra-long wheelbase. AM General M925, 6x6, 1984. Oshkosh MTVR, Medium Tactical Vehicle Replacement, 6x6, 7 ton off-road, 15 tons on road. Pict J M M, Le Bourget, 2006 06. Oshkosh MTVR Medium Tactical Vehicle Replacement, 2007. J M M collection. (T148 S1, 1972-82) from www.forum.index.hu. Oshkosh truck Model J, with wide, high flotation tires in oil-field industry in sands of China. Pict from book 'Oshkosh Trucks' of David Wright, 1992, Motorbooks International. Acco Giant Grader, early 80s, the biggest ever produced. Conceived by Umberto Acco in his Italy plant, Caterpillar engine is 700 hp at front and 1000 hp at rear. Mass about 200 tons. Only two built. Pict of 1997 from the book of Eric Orleman 'Super Duty Earthmovers' MBI Motor Book International, 2002. Dodge D700 Engesa, 6x6, 1970. Total mass 11,5 t, 198 hp. Pict from the book of Bart H. Vanderveen ‘The Observers Military vehicles Directory from 1945’. OTZ Amphibious tractor, 6x6, 1960, for forestry work. Manufactured at Onega Tractor Plant (OTZ). Pict from book 'Les véhicules spécialisés N° 4', from Alain Dupouy, Auto-éditeur, about1990. Valmet 1502, 6x6, prototype of the 70s. Lely 6x6 proto of the 70s. Saurer 6ML 6x6 tractor in the 50s. Pict from the book of Bart H. Vanderveen ‘The Observers Military vehicles Directory from 1945’, Warne, 1972. Renault Cargo, 10-Ton, 6x4, 1931. Pict from the book of Bart H. Vanderveen ‘The Observers Army Vehicles Directory from to 1940’, Warne, 1974. Scammell 6x6 vehicles. Above, Pioneer from 1928 and below, Pioneer transporter with 17 tons test load. Pict from book 'Scammell vehicles' by Bart Vanderveen, Warne, 1971. Scammell 6x6 and 4x4. From up to down : Mountaineer 4x4, Constructor 6x6, Constructor 85 T. Pict from review Commercial Motor, 1950 and 1955. Doc of J M M.
Scammel 6x6 Explorer of the 50's. Rear walking beams and front articulated axle made a 3 points suspension like agricultural tractors and allowed good travel suspensions equipped also with semi-elliptic springs front and rear. Petrol engine Meadows 10,35 l, 175 hp 6 cylinder. Picture from book of Nick Baldwin 'The Illustrated History of Off-Road Vehicles' Haynes Publishing, 1987. Scammel Explorer 6x6. From 'Wheels and Tracks' N° 72, 2001. Scammel Explorer 6x6 articulated front axle. From 'Wheels and Tracks' N° 72, 2001. Scammel Explorer 6x6 has been tested in the late 40s and built for British Army as recovery vehicle. It remained in service until the 80s. Rear wheels were fitted on a walking beam and the front axle had a transversal leaf spring tuning in its center, so off-road capabilities were improved. From 'Wheels and Tracks' N° 72, 2001. Kamaz 6x6. Pict J M M near Lambesc, South of France, August 1993. Kraz 255B at Saumur Museum, France, Febr 2002. Pict J M M.
Kraz 255B. Pict J M M.
KRAZ 255B 6x6, 1977. Large tires are original equipment. Pictures by J M Maclou at Bovington Museum, GB, on September 1994. KRAZ 255B 6x6, 1977. Large tires are original equipment. Pictures by J M M at Bovington Museum, GB on September 1994. Kraz 6x6. Pict J M M at la Locomotion en Fête, La Ferté Alais, 2010 06. Ural 6x6 trial proto with independently suspended and steering rear wheels. Pictured by J M Maclou at Montarlieu Vercieu, France, 2004 05 29. Titan 6x6 for oilfields. Titan Spezilfahrzeubau GmbH, Backnang/Sulzbach, Germany, since 1994, is leading manufacturer for Heavy-Duty and Special purpose vehicles 6x6 and 8x8 for oil industry, heavy tractors and fire fighting vehicles for airport. They have a parnership with Mercedes-Benz for producing Actros. Berliet GBO 15 P 6x6, 1962, at Foundation Marius Berliet, Le Montelier, near Lyon, France, on 2005 05. Pict J M Maclou. 45 GBO 15 P were built from 1958 to 1962. Berliet GBU 6x6, 1960. 796 units were built at Montplaisir plant, Bourg-en-Bresse. From 1967 to 1987, about 60.000 units of this truck were built in China. Speed 65 km/h. Pict J M Maclou at Foundation Marius Berliet, Le Montelier, near Lyon, France, on 2005 05. Berliet GXO, 1970 at Foundation Marius Berliet, Le Montelier, 2005 05. Pict J M M.
Berliet T 100 N°2 at Fondation Marius Berliet, Le Montellier, 2005 05. Pict J M M.
T 100 Berliet front axle. Pict J M M.
Berliet T 100 N° 1 from Venissieux, France, in 1957, pictured here 40 year later at Hassi Messaoud in Algeria. Pict from review 'Charge Utile' N° 177, Sept 2007, Special Readers Archives. Hendrickson Hulk from the beginning of the 70s were supervised by Bechtel. Two were built and after transformations sent to Alaska where they worked with 2 Melroe 8x8. They came back to the West Coast of USA in 2004 to be exploited by Lampson Rigging Company. Berliet 6x6. Pict J M M at Loco en Fête, La Ferté Alais, 2009 06 13. Berliet Gazelle 6x6, 1956. Pict J M M at Loco en Fête, La Ferté Alais, 2009 06 13. Berliet Gazelle GBC, 6x6, 1956. J M M at La Ferté Alais, 1998 06. ZIL-49042 Amphibious restored by the Military Museum Technical at Chernogolovka (Ivanovo) near Moscow. ZIL PSE-1 and PSE-2 for rescuing cosmonauts, restored by the Military Museum Technical at Chernogolovka (Ivanovo) near Moscow. Ural AZ Typhoon, 6x6. This truck is fitted with pneumatic suspension and is self-leveling. Pict J M M at Villepinte, June 2012. Renault AFD 1 6x4, 1935 and AFG 1 6x6, 1938. Pict from the book : 'L'Automobile sous l'Uniforme' by François Vauvillier, published by Massin, Paris, 1992. Mack 6x6, Volvo Group. Pict J M M at Villepinte on 2012 06. Hug Lugger Truck with Letourneau body, 1936. Center axle was not powered. Pict from book of Eric C. Orleman : 'R.G. LeTourneau Heavy Equipment, 1921-1953', Iconografix, Inc, 2008. FAR TT3 prototype, 1939. It appeared too heavy, too large and mechanically complex although fitted with good off-road performances. Pict from the book : 'L'Automobile sous l'Uniforme' by François Vauvillier, published by Massin, Paris, 1992. Alvis Stalwart, 6x6, Amphibious pictured by J M M at Alfortville, France, December 1993. Stalwart Amphibious Vehicle FV 620 then Mk 2 6x6 built by Alvis for British Army from 1966. Mass 9 t, payload 5 t. Only one differential between right and left group of wheels was not sufficient on road between front and rear wheels and could break transmission. Pict from 'Revue Internationale de Défense' in the 60s. Pict from 'Revue Internationale de Défense' in the 60s. Laffly S 45 in 1994 at La Ferté Alais, France. Twelve copies were delivered to French Army in May-June 1940 as tank wrecker. Empty mass : 8,2 t, payload : 2 t, power : 110 hp, Speed 36 km/h. Pict J M M.
Laffly S45 6x6 from 1940 shown here in the 80s. Rear wheels have typical position crossing a top hill. M. Hollos, Austrian engineer, conceived suspensions. S 45 was used as a wrecker with its winches and spuds. This one belongs to Montrichard Truck Museum. From 4x4 Magazine, Sept 1988. Laffly S45, 6x6, tested in 1937 and built in 1940 at 18 copies. It could tow 10 t, 110 hp, 8,2 t, payload 2 t, speed 26/36 km/h. Pictures by J M M at La Ferté Alais on June 1994. These vehicles are rare nowadays. Terrabus 6x6 of Foremost. Pict Francis Pierre, Alberta, 2001. M54, 5-ton, 6x6, 1956 equipped with Straussler Lysoïd tires and snow plow. Picture from book of Fred Crismon ‘US Military Wheeled Vehicles’, Crestline Publishing (Motorbook), 1983. M 35 6x6 truck at Loco en Fête, La Ferté Alais, 2004 06. Pict J M M.
MAN 6x6 on Versailles Castle Esplanade in December 1987, one day before starting of Paris Dakar Raid. It was the last time this raid started from Versailles. Pict J M M.
Leyland 6x6 Recovery 1958, Beltring, GB, 2004 07 23. Pict J M Maclou. 6x6 US Prototype, probably GM in the 50s/60s. Personnel Lorraine-28 Truck, 6x6, 1937. Pict from the book 'L'Automobile sous l'Uniforme, 1939-40' of François Vauvilliers and Michel Touraine, Massin Editeur, 1992. Lorraine-155, 6x6, 1935. License was from T84 6x6 truck from Czechoslovakia. Pict from the book 'L'Automobile sous l'Uniforme, 1939-40' of François Vauvilliers and Michel Touraine, Massin Editeur, 1992. 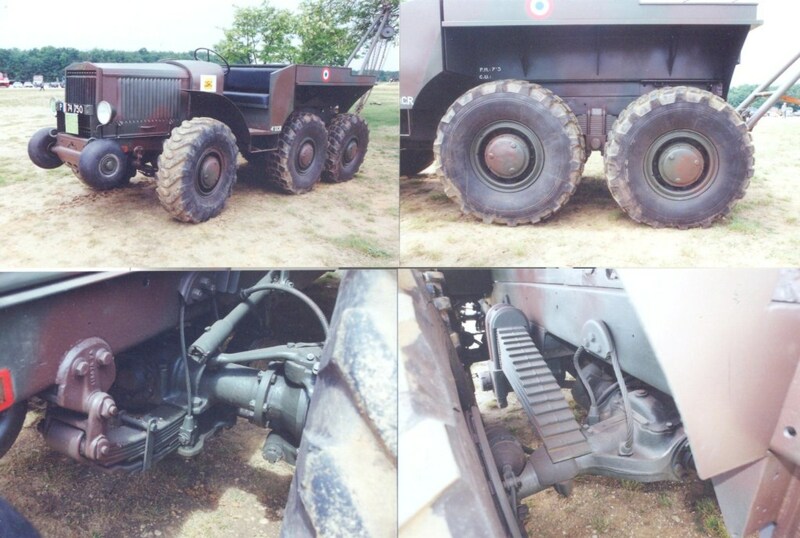 MATS, Moyen d'Amélioration de la Trafficabilité des sols, on Renault 6x6 TRM 10000. These 18 panels in cast aluminum can be laid on the ground to form a road of 11 m long and 4.2 m wide supporting 70 t wheeled or tracked vehicles. 50 m can be laid in 10 or 20 mn. Built from 1988 by Krauss-Maffei (KMW today) and fitted here on a TRM 10000 of total mass 24 t, speed 89 km/h. Today, petroleum industry uses these large panel matting system designed to provide stable access for heavy-duty applications including shoring, construction, drilling, mining, allowing heavy equipment to traverse varying ground conditions without problems. They allow to replace very special off-road vehicles by more conventional ones and grounds are relatively preserved. Picture by J M Maclou at La Locomotion en Fête, La Ferté Alais on June 1997. Nordwerk TT 140 B Dumper introduced in 1969 for 23 t payload was a forerunner. The oscillating front axle and tandem rear axles did not prevent the rigid chassis which was the weak spot of this dumper. AB Nord-Werk, Uddevalla, Sweden, disappeared at the end of the 70s. Hortsman Suspension on Dera 6x6, 1998. J M M collection. HLMC High Mobility Load Carrier DERA, Defense Evaluation and Research Agency, 6x6 prototype of 1998, designed for the British Army. Suspension from Horstman Defence Systems Limited, a Dowty Company. J M M collection. Volvo TL31, Truck 6x6 and 4x4 trailer in the 70s. Pict from the book of Bart H. Vanderveen ‘The Observers Military vehicles Directory from 1945’, Warne, 1972. TV 1000 Rhino 6x6 skid steering prototype of 1957 now showed at the Bovington Museum, Dorset, England. Developed by FVRDE and MRXE, the engine developed 535 hp and speed was 64 km/h on road. Pict from 'Wheels and Tracks' N° 47, 1994. Suspension of TV 1000 Rhino 6x6. Arms box shaped contains final drive chains. Pict from Classic Military Vehicle, June 2002. TV 1000, 6x6, 1957. Documentation J M M from Bovington Museum. Willème, Nanterre, W 8 SAT 6x6 about 1959. Icon truck of this brand which nevertheless disappeared from market a few years later. Doc J M M from Willème. ZIL PSE-1R, 1981, equipped with turbojet already tested by Research Institute 100 on tracked vehicles to help in bad conditions(mud, snow). from http://alternathistory. CAT 783, 1965 with Cat diesel electric drive, 100-ton capacity, was a side dump hauler (right or left). 348 hp. Pict from book of Eric C Orleman : ' Caterpillar Chronicle', MBI 2000. CAT 783 redesigned in 1967, rear dump body. Pict from book of Eric C Orleman : ' Caterpillar Chronicle', MBI 2000. Yermak 6x6 truck of 1963. Picture from book of Nick Baldwin 'The Illustrated History of Off-Road Vehicles' Haynes Publishing, 1987. PSE-1M, 6x6 for transport 3 cosmonauts and doctors on landing site. PSE-1R, 6x6, amphibious, 1984, equipped with gas turbine of thrust of 1750 kg for getting out rivers. It was very efficient. It was also equipped of skis for high speed on deep snow. Unfinished study by lack of funding. This 6x6 wheel vehicles are really amazing and heavy, they are able to travel in any situation, thanks for sharing the post.